With reference to the above subject the undersigned is directed to state that in some of the CGHS Cities the areas covered under CGHS were not specified resulting in inconvenience to the beneficiaries. The matter has been reviewed and it is now decided that hereinafter the Coverage of CGHS shall be limited to the areas within 5 km (approx.) 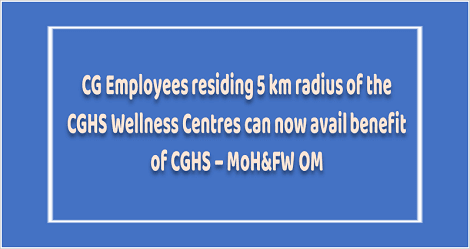 radius of the CGHS Wellness Centres , in all CGHS covered Cities, where such demarcations were not specified. The Additional Director, CGHS concerned City shall notify such areas covered under CGHS Wellness Centres.